Residents of the Ulpana neighborhood say that the evictions are a dark day which also marks the beginning of new building. 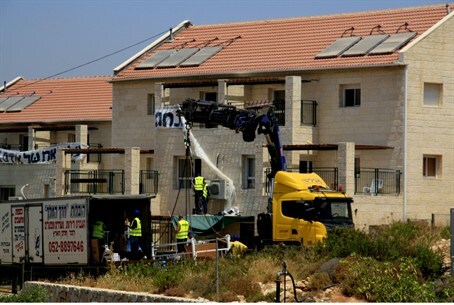 Arutz Sheva heard Baruch and Michal Kitay, residents of the Ulpana neighborhood of Beit El, who summarized their experiences of the eviction of the neighborhood's residents on Tuesday. The first 15 families moved out of their homes without any resistance, following an agreement between the Beit El leadership and the government, which has promised to build 300 new homes in Beit El. Another 15 will leave their homes and move to a nearby neighborhood of temporary caravans on Thursday. “The Ulpana neighborhood is going to expand to 330 houses in the first stage, and then on and on and on,” he added. Michal Kitay emphasized the support that the residents have received, not just from their neighbors in Beit El but from Israelis all over the country.